Kyoto <-> Himeji - Osaka. Well, today was supposed to be the day I would go to Hiroshima, but I just couldn't get my stuff together early enough. So I decided to visit Himeji instead, which was less than a hour away from Kyoto by the shinkansen train. 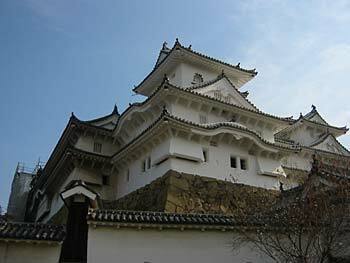 Himeji's star attraction is the Himeji-castle, which is the oldest castle standing in Japan (built in 1580), partly because it never was attacked. The castle was about a 15 minute walk from the station. One positive thing I instantly noticed at the castle was the near non-existence of high school students, which was a good change after seeing them everywhere at other historical tourist spots. The castle itself with its courtyards and barracks was interesting and it was pretty amazing it has preserved so well through all these centuries. But despite the architectural oddities and castle beauty, it didn't really awe-inspire me in the end. It was "just" a castle in the end. Sorry, castle-freaks. This doesn't mean it isn't worth checking out, though! With lots of time still in my hands, I checked out the near by Koko-en garden, although I feared it would be a waste of time when I could have used my last chance to go to Hiroshima instead. The Himeji Koko-en garden was constructed in 1992 to commemorate the 100th anniversary of the establishment of Himeji municipality. But since this isn't really an interesting point, I will say that it turned out to be a splendid garden! 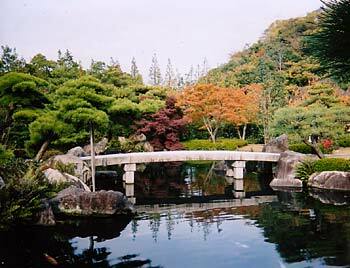 The whole area was split into nine main gardens and they were made according to the Edo period style. They were really professionally made, had a very idyllic atmosphere and those autumn colours really shined in these gardens. No wonder there were professional photographers taking pictures all over the place. After admiring the garden for a while and wishing our back yard had even half the magic, I filled out a questionnaire at the front gate before leaving. While I was filling it, two guys in neat suits were paying the entrance fee for the garden. It was time to head back to the station after having lunch in a small restaurant (and watching some Japanese drama show while eating). When I learned that the next train to Hiroshima wouldn't leave in 50 minutes and the time was already past 4:00pm, I decided to give up and head back to Kyoto. 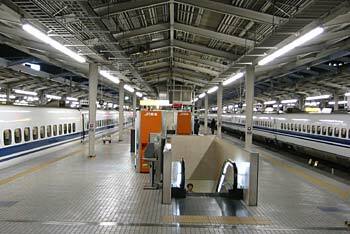 4:00-5:00pm seemed to be a rush hour even for shinkansen trains, as it mainly was filled with tired salarymen. When the train was closing into Osaka, I had this sudden idea checking it out just for kicks, even though people have said Osaka is not an exciting place. Otherwise it didn't dramatically differ from Tokyo, but then again I didn't stay around longer than two-three hours before I had enough. 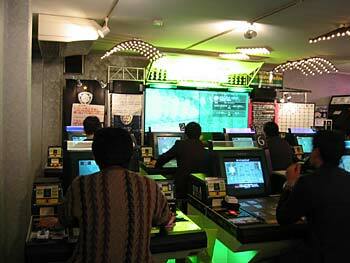 There is one thing I saw in a game hall worth mentioning though (I had to check this thing out myself as some people back in the guesthouse talked about this). There is this football league game system where you make a team by buying magnetic cards that represent different football players. You place these on a magnetic table and then play a match in the league you have chosen. These player's statistics can be improved in the card, so basically we are talking about a combination of trading card games and video gaming. Think of the transfer scene between the team managers! If this kind of system ever hits Europe, it surely would be a massive hit! I could have used a local train to get back to Kyoto, but since it was free to use the shinkansen, I took a seat for the next one going that direction. At Kyoto it was back to the guest house, cursing myself for missing both Hiroshima and Shonen Knife, then exchanging the day's events with the other guests before heading for my last night in Kyoto. Himeji-castle, beautiful but otherwise failed to make any real impact on me. 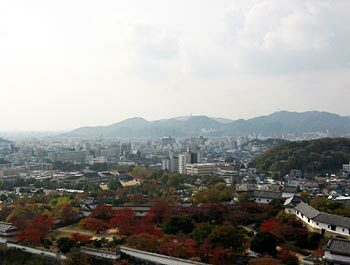 Himeji the city from Himeji the castle. One of the gardens at Koko-en close to Himeji-castle. Football played with a magnet table and cards (in some game hall in Osaka). Shinkansen station at Osaka. Notice how litter free it is. Himeji castle - While the castle is a beautiful piece of architecture, the website fails to capture it. Himeji koko-en - This garden next to the castle is a must for garden freaks. 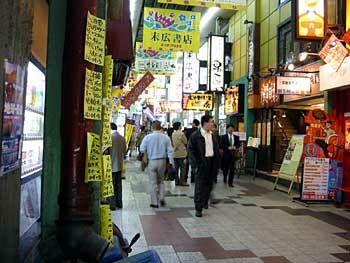 Osaka - Okay, I was there, but I really didn't a good idea of the city.